Many people remember the civil war in El Salvador – between the rightwing government forces (supported by the US) and leftwing FMLN guerrillas. The war lasted 12 years and ended in 1992 but 70,000 people died. The country seems calm since then, but is not. In June 2014, Sánchez Cerén (who was a FMLN rebel) became president. There are nearly 30 murders every day. El Salvador could soon be the most violent country in the world (not including war areas eg.Syria). In 2012, the two main gangs (MS-13 and Barrio 18) made an agreement not to fight. But this ended in 2014, when El Salvador had the most murders since the civil war. 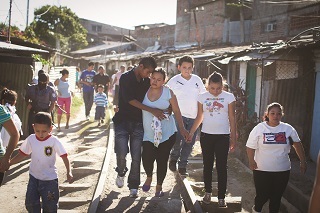 The Catholic Church helped the gangs make the agreement, and Mauricio Funes, who was president, agreed. The number of murders fell by half. And everyone hoped El Salvador could stop being violent. Gang leaders in high-security prisons were sent to normal prisons. The Red Cross checked human rights in prison. So the gangs agreed to: stop making children and young people join them; keep schools and buses peaceful; not attack security forces so much; and give up some weapons. This plan to cut violence by agreement with criminal groups, and let the gang members come back into society - not simply punish them – was new. This was very different from the very strict plans before this. But when the public found out about the details of the plan, many people did not agree. Conservatives and the media did not like the acceptance of criminal organizations. And they said the number violent crimes was not going down. Then the agreement failed when the government did not give money for prevention and rehabilitation programmes. Then, when Sánchez Cerén became president, he did not support the agreement. They took the gang leaders back to maximum-security prisons and violence increased again. The agreement failed. But it showed how the inequality and lack of opportunities allow gangs to get young people to join. There is a very big difference between the small group of rich people in El Salvador and most of the population. This was the main problem that caused the civil war, and it is still the problem now. Many Salvadorans have gone to live in the US in the past thirty years. They are leaving unemployment, the civil war and natural disasters eg. Hurricane Mitch in 1998 and earthquakes in 2001. Now, one in three Salvadorans lives in the US. Money they send to their families is now El Salvador’s main source of income: $4.2 billion in 2014. Some people who moved to the US during the war joined dangerous Latino street gangs there for protection and to earn money. 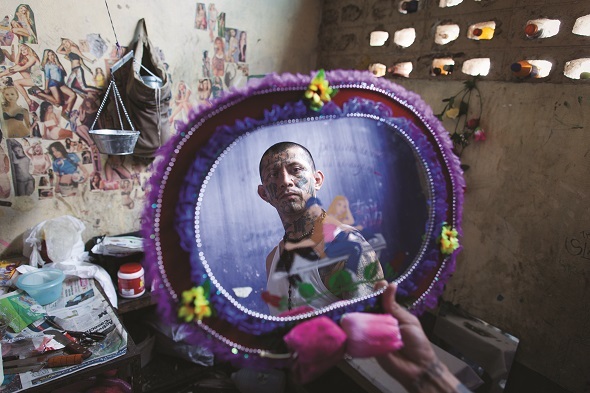 In the mid-1990s, the US sent many gang members back to El Salvador. They took the violence back there. The Salvadoran authorities say the gangs are responsible for the violence. But many recent murders are because of drugs. El Salvador has a lot of corruption. So it is easy for drug gangs to get connections in the police and other institutions. El Salvador is now an important place for shipping drugs north to the US. Insight Crime (a thinktank in Washington) says crime in El Salvador now looks more like a war. Country profile: El Salvador Facts Leader President Salvador Sánchez Cerén. Economy GNI per person $3,720 (Guatemala $3,340, United States $53,670). Money US dollar (they changed to US dollar from colón in 2001). Main exports Clothing, coffee, electrical capacitors, raw sugar. Money sent from family in other countries was 17% of GDP in 2014, helping a third of families. It is part of the US-sponsored ‘Plan of the Alliance for Prosperity in the Northern Triangle’ with Guatemala and Honduras. People 6.3 million. Annual growth 0.7%. People per square kilometre 301 (UK 260). Health Infant mortality 14 per 1,000 live births (Guatemala 26, US 6). Lifetime risk of maternal death 1 in 600 (US 1 in 1,800). HIV 0.5%. Environment They have cut a lot of trees so now only have 6% of the original forest. About 75% of the land has problems with erosion and desertification (20 tons per hectare per year). Religion Catholic 57%; Protestant 21%; Jehovah’s Witness 2%, other or none 20%. Language Spanish is the main and official language. The indigenous Nahuat language has survived but is only used by small communities in the west. Human development index 0.662 (Guatemala 0.628, US 0.914). Income distribution They signed peace agreements in 1, but they have done nothing about the inequality that caused the civil war. Life expectancy 72 years (64 in 1992). Position of women El Salvador has one of the strictest anti-abortion laws in the world. This puts lives of women and girls at risk. 46% of females work, and 77% of males. There are far more men in office work than women. Literacy 85%. 95% of children are enrolled at primary school. Freedom Some labour activists have been murdered or disappeared. Activists against free trade agreements, environmental destruction and water privatization have had problems. Sexual minorities Homosexuality is legal for both sexes after the age of 18. There is a law against discrimination because of sexual orientation. But there is a lot of anti-gay harassment and gay rights activists have had death threats. NI Assessment (Politics) President Sánchez Cerén has tried to show that he is not radical even though he was part of the revolution. He has been to other countries to get business eg. he went to the US to meet World Bank representatives. He has continued with the social-welfare programmes introduced by the president before him. But he has not increased spending on education to 6% of GDP, as he promised. There is still a lot of corruption, eg. in the police. So many people do not trust government institutions. NOW READ THE ORIGINAL: http://newint.org/columns/country/2015/11/01/el-salvador/ (This article has been simplified so the words, text structure and quotes may have been changed). This page was last edited on 9 January 2016, at 19:40.